Dana Point Real Estate is considered to be more affordable in Real Estate Home prices compared to other beach towns in Orange County. Dana Point is the second to last southern beach town in Orange County, Ca as you head down to San Diego. It's not unusual for Real Estate in Dana Point to be nearly half the price of Laguna Beach and Newport Beach properties. One of the newest communities in Dana Point is the Ocean Front community "The Strand At Headlands" It features over 100 custom Dana Point homes located right on the beach. If you are looking for beachfront homes on the sand then Beach Road is the place. It features over 185 custom beach homes right on the sand and most of the homes for sale on Beach Road will start over $3 Million dollars. 1) Capistrano Beach is a neighborhood similar to that of the Southwest San Clemente area of San Clemente where you have a wide mixture of custom homes that were built from the early 1920's to brand new construction homes. It's not unusual to find a newly built two story home surrounded by smaller one story beach homes. The location to the ocean is very close by getting down to the beach does require going down the hill on either side of "Camino Capistrano" street beach access. 2) Monarch Beach is the Newport Beach of Dana Point. This is where you will find numerous gated communities with polished streets and very expensive real estate. 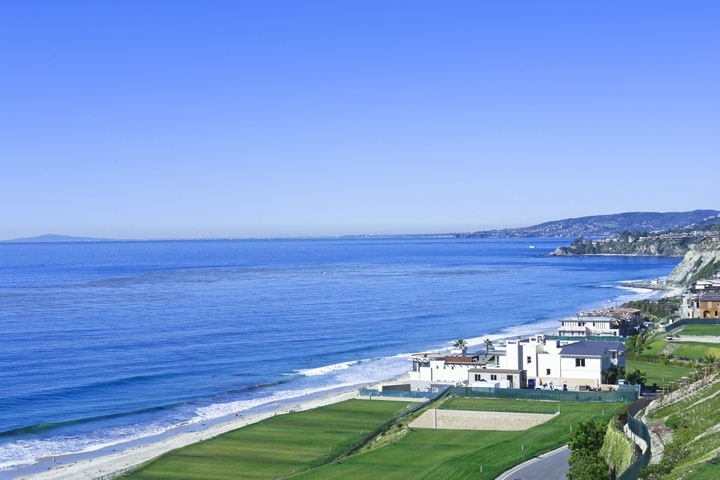 It's home to some of the most exclusive neighborhoods in all of South Orange County and is no wonder that the Ritz Carlton and St. Regis hotel call Monarch Beach home. The St Regis even has it's own luxury condo's offered for sale located right on the grounds of the hotel called the St. Regis Sea Villas, St Regis Sea Village and the new Grand Monarch community. Monarch Beach estate homes can be found in the communities of Monarch Bay, Monarch Bay Terrace and Monarch Bay Villas. Other popular communities like Cape Cove and Marquesa at Monarch Beach are wonderful gated communities in Dana Point that feature beach close homes in the million dollar range. 3) Lantern Village Is one of our favorite areas. It's home to wonderful gated communities like Lantern Bay Estate and "The Admirality", Lantern Village is a collection of beach and harbor close homes and condos that are within walking distance to the Dana Point Harbor and Doheny Beach. Typically there is a premium in price for this close of a proximity to the beach while quality homes in this area are slow to come on the market. 4) Dana Hills is home to traditional single family homes built in the 1970's and is close to the Dana Hills High School and Laguna Niguel. It has a real family oriented feel to it and it reminds me of the homes I grew up with in the midwest. There isn't the glitz of Monarch Beach but a real sense of community can be found here. 5) Del Obispo area of Dana Point borders San Juan Capistrano and the homes in this area have a more country feel to them with larger lots and wider streets. Please contact us at 1-888-990-7111 with questions regarding these area and any of the homes listed for sale here. "A Tennis Villas condo has just been sold by Beach Cities Real Estate agent Jackie Brown who represented the buyers. nbsp;30 Wimbledon, Dana Point sold for $750,000 and closed escrow on 2/25/2019. n... "
"A Harbor Cove condo in Dana Point, California has just been sold by Beach Cities Real Estate agent Jackie Brown who represented the seller. 24582 Del Prado 207, Dana Point sold for $625,000 and clo... "
"A Silvertide condo in Dana Point, California has just been sold by Beach Cities Real Estate agent Jennifer Wetzel who represented the owner. nbsp;36 Bright Water, Dana Point sold for $578,000 and c... "